After our three days of hiking in the mountains north of Cilaos, it was time to return to civilization. In this case, the city of Saint-Pierre, the largest city on the island, which has a surprisingly nice beach, and a very vibrant cultural scene. Saint-Pierre was also a return to actual restaurants. The entire beachfront in town is filled with a variety of food trucks, cafes, and restaurants, and we ended up settling on Le Moana, a Tahitian restaurant (Tahiti being yet another French island…). But, being Réunion, what is dinner without some, well, rhum. 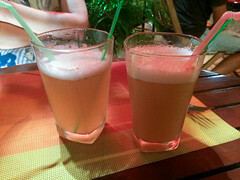 So some rum drinks were in order to ease our tired muscles from all that hiking, so we ordered up a pair of most excellent Boucaniers (rum cocktails with citrus, peach, and pineapple). Indeed, it’s the exact sort of cocktail that really highlighted the most excellent taste of the local Victoria pineapples, so as I’m writing this, I’m finding myself seriously jonesing for a good Victoria pineapple). Interestingly, I found that many, many places on Réunion served up one or both of the French classics: steak frites or a steak tartare. This surprised me a bit for an island, especially when I noticed that most menus called it out as “a la pays” (“native”), since while we had seen a lot of agriculture (particularly sugar, vanilla, pineapple, and bananas), we hadn’t seen a lot of farms or ranches. 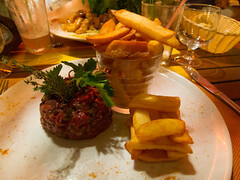 Turns out, we just hadn’t been to that part of the island yet, but I’ll have to say, a tartare made with island beef was quite delicious, and served up with some wonderful, crispy fries. Carol did pretty good as well, opting for some pasta and shrimp (shrimp being another item intensively cultivated in the region, although I never did find where either the ocean or freshwater shrimp farms were). 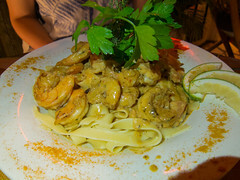 This was some excellent shrimp in a delicious cream sauce (it’s a bit of a trope, but the French are awesome with sauces), and the pasta was cooked just to the point of perfection. Overall, Le Moana was a rather nice little find. 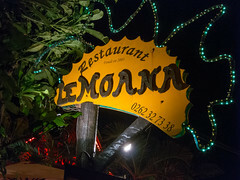 While the local Creole food of the island was indeed awesome, it was nice to get a change-up for the night, and Le Moana had some pleasant service, a rather nice ambiance, and a perfect location just off the beach.